While winning awards is certainly not the motivation behind our efforts, the recognition is always appreciated. Below is a list of our most recent awards and recognitions. For the sixth consecutive year, SLS Consulting has been inducted into the Best of Pasadena Business Hall of Fame for Internet Marketing and SEO Service. We are proud to be recognized as a well-known and established boutique legal marketing consulting group, which continues to provide personable and rapid client development. SLS Consulting, has been selected for the fifth consecutive year (2009 - 2013) for the Best of Pasadena Award in the Internet Marketing & SEO Service category by the U.S. Commerce Association (USCA). We are proud to be recognized as a well-known and established boutique legal marketing consulting group, which continues to provide personable and rapid client development. It is with great enthusiasm that SLS Consulting announces winning not one, but two 2012 Website Winner 18th Annual Communicator Awards: one for Excellence in the Corporate Communications category and one for Distinction in the Law and Legal Services category. SLS Consulting has been ranked in Lead411's Technology 500 List for 2010. The list is comprised of the renowned company's final rankings of the fastest growing tech businesses in the United States. Susan Ziegler receives a Certificate of Appreciation In Recognition of Exceptional Leadership. "For serving on the board, sharing and executing a vision that has benefited the children and families in South Pasadena. 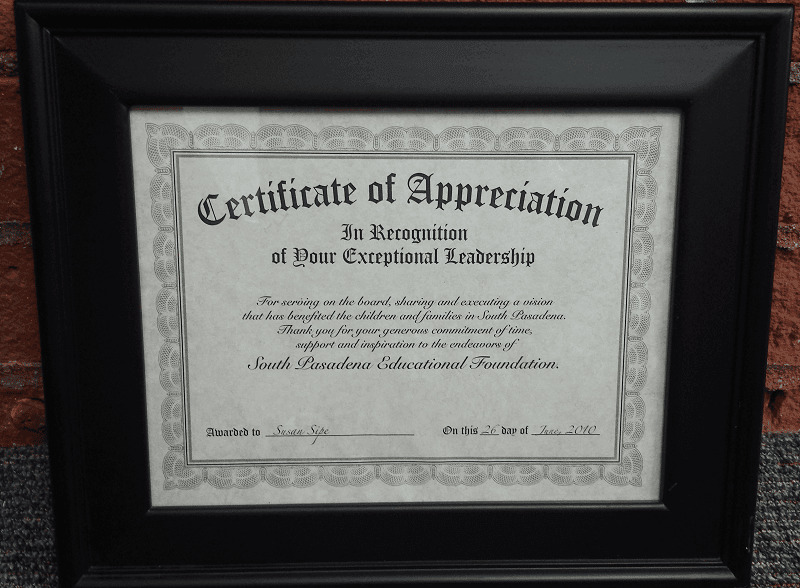 Thank you for your generous commitment of time, support and inspiration to the endeavors of South Pasadena Educational Foundation." Our SEO team has obtained certification after successfully passing The Google Analytics Individual Qualification (IQ) exam, which demonstrates proficiency in Google Analytics. SLS Consulting employs designers that have achieved Adobe Certified Associate status in Visual Communication; Graphic Design and Illustration; Print & Digital Media publication; Web Authorizing; Video Communication and Adobe Certified Visual Design Specialist. SLS Consulting, has completed 4 training sessions for certification by Planet Ocean in SEO. Requirements include passing an exam demonstrating critical understanding of the fundamentals of search engine optimization. SLS Consulting, passed a written exam demonstrating critical understanding of topics relating to Mobile Responsive Design, as well as participated in the SEO Masters Training Course on Site Audits. SLS Consulting, has completed all requirements for certification by Planet Ocean in the topic of Advanced Local Search. Requirements include passing a written exam demonstrating critical understanding of advanced topics relating to Local Search. SLS Consulting, has completed 6 training sessions for certification by Planet Ocean in search engine optimization. Requirements include passing a written exam demonstrating critical understanding of the fundamentals of advanced SEO.